We are pleased to announce that Professor Paul Babie has been appointed as the new General Editor of the Property Law Review. Professor Babie will replace Professor Brendan Edgeworth, Professor Pamela O’Connor and Dr Cathy Sherry who recently stepped down as General Editors. 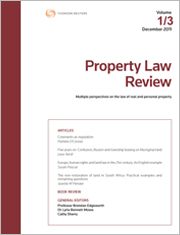 We would like to thank the outgoing General Editors for their contribution to the Property Law Review. Paul Babie is a Professor of Law in the Adelaide Law School of The University of Adelaide. He is currently Associate Dean of Law (International) of the Adelaide Law School and Associate Dean (International) of the Faculty of the Professions. He holds a BA in sociology and political science from the University of Calgary, a BThSt from Flinders University, a LLB from the University of Alberta, a LLM from the University of Melbourne, and a DPhil in law from the University of Oxford. Following law school in 1992, he was an Associate with Howard, Mackie (now Borden Ladner Gervais (BLG), Canada’s largest national law firm) in Calgary, Canada, specialising in oil and gas, commercial and securities law. He is a Barrister and Solicitor of the Court of Queen’s Bench of Alberta (Canada), and an Associate Member of the Law Society of South Australia (in which capacity he is a member of the Property Law Committee). He has previously taught at the University of Oxford and the Melbourne Law School, and joined the Adelaide Law School in 1999. Professor Babie’s primary research interests include property law, private law theory, property theory, and law and theology. He has published and spoken extensively in these fields and will continue in his role as the South Australian Section Editor of the Property Law Review. We wish Professor Babie all the best in his new role.